We are gonna be back and better than evah! The Colonel and I have just secured ourselves a domain and we will be transferring this blog over to it ASAP... We will keep you posted! We're looking forward to the move. While your at it check out "the Grey Goose effect"
Sorry for the really long absence but I've been very busy lately. I want to recommend a Cachaca I recently tried, which a Brazilian friend of mine brought back with him. 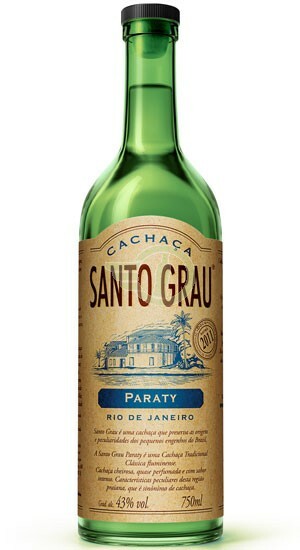 Santo Grau Cachaca: this was really smooth, one of the smoothest I've ever had, a nice sweet floral flavor. Excellent for cocktails like a Caipirinha or sipping. I believe that I had the Prata (silver), but which ever one it was, all I know is that it was good. "An alcoholic drink a day can help keep heart disease at bay, according to a review of 30 years of research. The work, published in the British Medical Journal, showed a 14% to 25% reduction in heart disease in moderate drinkers compared with people who had never drunk alcohol. Another article, by the same Canadian research group, showed alcohol increased "good" cholesterol levels... For many years, studies have suggested that drinking alcohol in moderation has some health benefits. Scientists at the University of Calgary reviewed 84 pieces of research between 1980 and 2009. One unit of alcohol in the UK, equivalent to half a pint of normal beer, contains 8g of pure alcohol. This review showed that the overall risk of death was lower for those consuming small quantities of alcohol, 2.5g to 14.9g, compared with non-drinkers. The researchers also say regular moderate drinking reduced all forms of cardiovascular disease by up to 25%." ¡Ay Dios Mio! 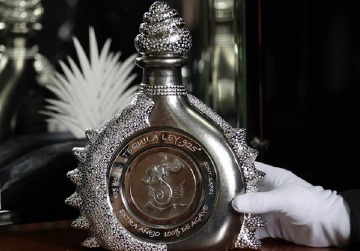 The Worlds Most Expensive Tequila Up For Auction? Last month we mentioned the worlds most expensive whisky. Well this month is Tequila month at KYSU, we'll try to get some tequila based cocktails and reviews in this December. *Update* we'll try to get some tequila based cocktails and reviews ASAP. According to The Luxist a special bottle of tequila is supposed to be auctioned off in London, with the hopes that it will go for a bid of $3.5 million.The previous price record for a bottle of tequila was $225,000 for a bottle also made by La Capilla. The Tequila called "The Law of the Diamond" or in Spanish "La Ley Del Diamante", crafted by by the Tequilera Hacienda La Capilla, comes in a diamond encrusted bottle. There are supposedly more than 4,000 diamonds in the bottle and about 2 1/2 kilos of Platinum, making this one heavy bottle of tequila (in more ways than one), weighing in at approximately 8 kilos. Oh, and yes, it is a 100% agave tequila. No Mixtos here. All I have to say is just wow! $3.5 could buy a lot of bottles of many other great tequilas but I guess that bottle must make a nice center piece. Just hope that your wife doesn't throw out the bottle when it's finished. Is Grey Goose's Goose Cooked? According to an article I came across today in the Hartford Business Journal Online Vodka trends are beginning to reflect the recession. "Make mine a Vodka martini, but hold the Grey Goose. Even liquor gets impacted by the economy with consumers searching out the best values when they head to their local liquor stores. That's why importers and distributors are targeting the retail market with super-premium vodkas at popular prices. Case in point would be Wodka, a Polish vodka imported by Panache Imports of Brooklyn and distributed in Connecticut by Ace Distributing, a seven-year-old Plainvile company. Panache president James Dale likes to brag that the days of people paying too much for overpriced Grey Goose that costs "for $50 a liter are over." His Wodka vodka costs about $13 a liter." Later the article goes on to say that "people are sick of overpaying", us consumers can only hope that we will at least benefit from a new trend: quality spirits for a normal price. Today we are going to review two different kinds of Cachaca. Not only are they from different brands but they are different styles. One being gold, or ouro in Portuguese, which is usually aged. The other is Silver or Prata, usually, but not always, un-aged. Both are industrial brands. Gold Cachaca is more for sipping and silver is usually used in caipirinhas and Batidas. 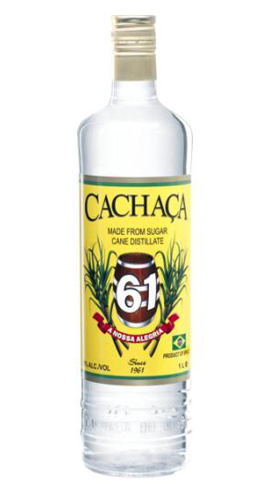 We'll start with the Prata: Cachaca 61 is produced by Missiato in São Paulo, Brazil. Cachaca 61 should not be confused with Cachaca 51. Both are named after the year of the brands origin. 61 is 40% abv. It is crystal clear, absolutely no color. This one has a sweet but strong smell of alcohol, grapes and figs and bit dusty. Its initial taste is slightly lost by the "heat" of the alcohol, powdered sugar followed by pepper. Now let's move on to the Ypioca Ouro (ee-pee-oka) is produced by the Ypioca group in Ceará, Brazil. According to the label Ypioca ouro has been aged for two years. Ypioca is 39% abv. Pale, faded gold. In the aroma the alcohol is not as overpowering as the 61. Sweet grape aroma, banana and rosted nuts, praliné. Soft, gentle, caramel, praliné, fruits with a hint of pepper lingering on the tongue. Now I truly understand why ouro is mainly for sipping and prata for mixing. Although I have tried both sipping the prata and mixing the ouro, the prata is a bit too rough and hot to be sipped where as the ouro is understated when mixed into a caipirinha. Either way if you are a fan of Rhum Agricole, Daiquiris, Mojitos etc... you should give Cachaca a try by sipping an ouro or with some prata in a caipirinha or batida. Shake with ice strain into a cocktail glass and garnish with an orange peel. Very refreshing like The Pegu Club.